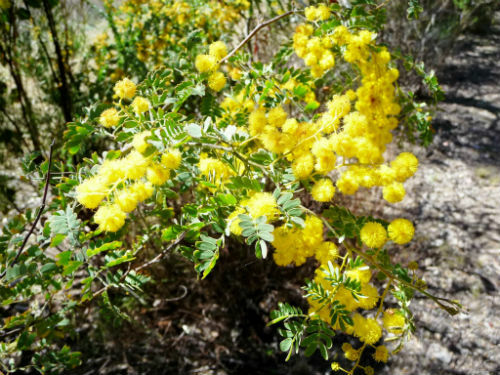 Acacia spectabilis, Mudgee Wattle is a tall spindly shrub or small tree with arching branches. The bipinnate leaves have pinnules or segments in four to eight pairs. Golden yellow flowers are held in globular clusters. Each cluster contains 20-35 individual flowers. The clusters are held in long racemes. Flowering is prolific from late winter to spring. A. spectabilis would make a colourful addition, as a background plant, in native shrubberies. Mudgee Wattle occurs in the Central and North-western Slopes of NSW and southern Queensland. The species name refers to the showy floral display whilst the common name is a town in the Central West of NSW.